“Pure Joy of Water” was on display at the “Sizzling Summer Social” at the GROHE Live! Center. From left to right, Cheryl Dixon, Head of Brand and Trade Marketing for GROHE America; Kent Brasloff, NKBA Manhattan Chapter President; and Antonia Koller, Grohe Live! Center Manager. 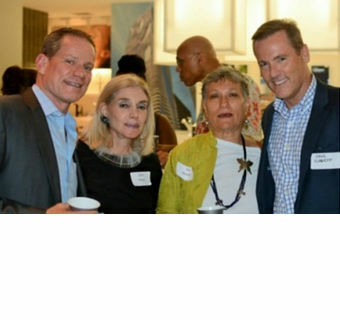 NEW YORK, July 29, 2015 – Last week, the Manhattan Chapter of the National Kitchen & Bath Association (NKBA) held its “Sizzling Summer Social” event in conjunction with the New York Chapter of the International Design and Furnishings Association (IFDA) at the newly renovated, experiential GROHE Live! Center and rooftop lounge in the heart of the Flatiron district. The event provided the opportunity for networking and rewarded the support of the respective organizations’ membership in a relaxed and celebratory environment. Guests were invited to tour the showroom while sipping on their own custom-crafted cocktails made with sparkling water from GROHE® Blue Chilled + Sparkling, one of the biggest innovations in the category in decades. The water system combines the modern look of a designer faucet with a high-performance filter, cooler and carbonator for a choice of filtered and chilled, medium sparkling or full sparkling water all in the same tap. Guests enjoying the festivities at the “Sizzling Summer Social” hosted at the GROHE Live! Center. From left to right, John Risch, Showroom Manager at Häfele USA; Chris Prince, NKBA Manhattan VP Programs-Elect; Patricia Gericke, interior designer, and Dave Scherff, Vice President, Eastern Business Group, Steelcase. A social media contest invited guests to create their cocktails or “mocktails” featuring sparking water from Grohe Blue Chilled + Sparkling and take a creative picture to post on Instagram or Twitter to enter. The winner, Alix Anopol, Sales & Design Associate at Walker Zanger, received a $50 gift card to Eataly. Guests also enjoyed interacting with the working shower wall, where they tested out the broad range of products, including rain showers and hand showers with multiple spray settings as well as the new kitchen bar showcasing popular designs, including the K7® Semi-Professional faucet and award-winning Minta™ Touch faucet. 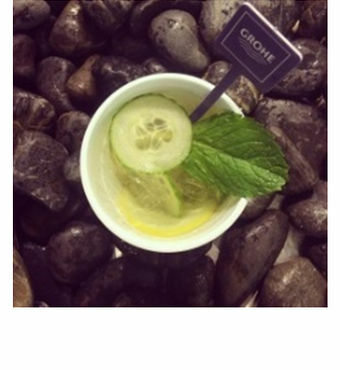 Titled “GROHE on the Rocks,” this cocktail/mocktail photo by Alix Anopol, Sales & Design Associate at Walker Zanger, made with sparkling water from the GROHE Blue® Chilled + Sparkling system was the winner in the event’s social media contest.